Scott Walker is now against legal immigration: The Wisconsin governor’s new position could have huge implications for the GOP presidential primary race. The Wisconsin governor’s new position against legal immigration could have huge implications for the GOP race. Wisconsin Gov. Scott Walker addresses the 42nd annual Conservative Political Action Conference (CPAC) on Feb. 26, 2015, in National Harbor, Maryland. In the past, Republicans were merely opposed to illegal immigration. Mitt Romney touted “self-deportation” as a solution to unauthorized immigrants, while figures like Iowa Rep. Steve King channeled grassroots intensity to torpedo comprehensive reform and force a new course for Republicans such as Sen. Marco Rubio, Jeb Bush, and even Walker, who was for immigration reform before his move to the national stage. Legal immigration, by contrast, was uncontroversial. The same Romney who took a hard line on illegal immigration also promised foreign-born students that he would “staple a green card” to their college diplomas, and the same Sen. Ted Cruz who denounces “amnesty” at every opportunity has also argued for increasing the cap on H–1B visas—for skilled workers—by 500 percent. You heard us last night at that debate … One of the things that I still can’t get over is the idea that a state would decide to give a $100,000 discount to illegals to go to school in their state. It is simply wrong to create that kind of magnet. It cannot be sustained. My friend, Gov. Rick Perry, said that if you don’t agree with his position on giving that in-state tuition to illegals that you don’t have a heart. I think if you’re opposed to illegal immigration it doesn’t mean you don’t have a heart. It means that you have a heart and a brain. For a candidate trying to show his conservative bona fides to a skeptical base, Perry’s immigration stance was a godsend. Romney could tack to the right of the Texas governor, and other candidates would follow suit in a similar effort to box out a potentially serious opponent. And, with the help of Perry’s feckless campaign, he did just that, all but pushing the governor out of the race (that would take a few more months and a few more failures). Walker isn’t blessed with the same caliber of opponent. Bush might be flabby from a long break from politics and Rubio might be a little too young and a little too eager, but both are shrewd men of good political judgment. They’ve distanced themselves from comprehensive immigration reform, even going as far—in Rubio’s case—to disavow their own proposals. But broadly, they’re still interested in trying to integrate unauthorized immigrants into American society, and using that as the basis for shared appeal to Latinos, Asians, and other groups with strong ties to immigrant communities. Those are strong positions in the Republican primary; restrictionist enough for conservative voters but not too draconian for a general election. That is, if the base doesn’t follow Walker on legal immigration. If it does, then he may raise the cost of that “moderate” position, forcing them to switch gears and move toward him. 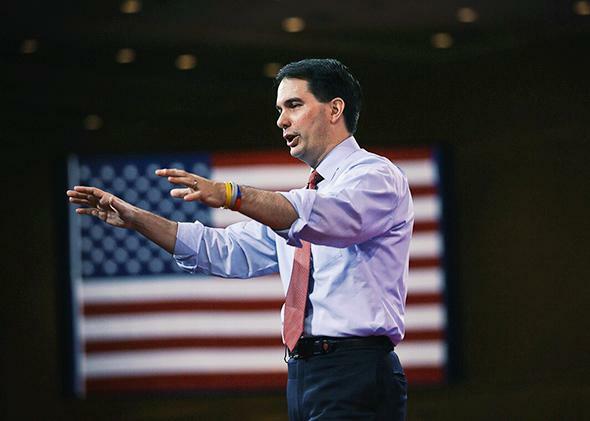 Not only could Walker win votes, it would fit with his persona as the Republican who doesn’t have to compromise, the candidate who can win without ever budging from conservative principles. And then there’s the issue of the general. Romney hurt himself with “self-deportation,” leading to tremendous damage with Latino and Asian voters. Walker is on track to do the same, but turned to 11. How will nonwhite voters respond to a candidate who doesn’t want any immigration? By voting against him, in droves. Then again, if the economy falters between now and next November, and if Walker is the nominee, then it might not matter. Walker could take this hyper-restrictionist stance on immigration and prevail in a presidential election, vindicating his extremism. Indeed, while Walker may not gain with his new stance on immigration, he won’t get hurt either; not with Republican voters, not with the general public, and not with his chief benefactors. No, the Koch brothers haven’t officially committed to Walker as their choice for the GOP presidential nomination—they’re still holding “auditions”—but he’s been a loyal and important ally in Wisconsin, even if he’s to their right on immigration. Given his strength as a politician and his success as a governor, why would they let that get in the way of promoting an effective operator? Their priorities are low taxes, few rules, and a threadbare safety net, and on those items, Walker is a sure bet.